The Maga Chronicles | Letters. Lessons. Laughs. 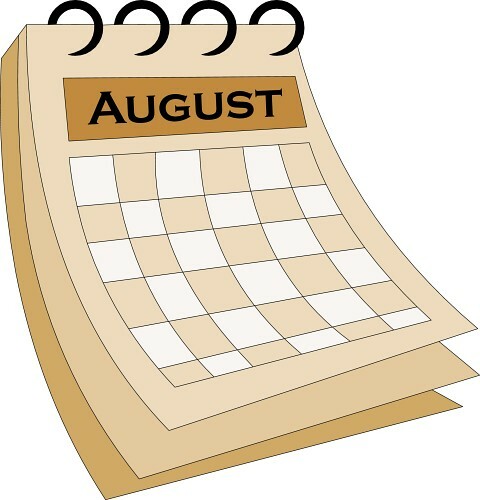 August. What Am I Going To Do With You? Just when you thought it was safe . . . August hits. Oh, August. I used to really like you. But that was a long time ago. That was back when I still had a whole month off before I had to go back to school. I still had a month to ride my banana-seat, butterfly-handlebar bike (with the basket adorned with colorful plastic flowers) to my friend Linda’s house. A month to take our bikes to West End Park and go swimming in Lake Superior, even though it was cold as ice. A whole month of root beer floats, penny candy from Ben Franklin, playing outside till the sunset late in the evening. Ah, life was pretty much a bowl of cherries back then. And then “growing up” happened. And that’s when I started not liking August. I think the first time it hit me was when I first went away to college. (Maybe I have September to blame, but by the time September rolls around, I start to feel a little better.) That first year going away to college was pretty tough for me. It was only about 4 hours away from home, and I’d been there several times as my older brother and sister went to school there so I was familiar with the campus. And yet when it was my turn to be a student there, it was so not easy. I think I’ve since discovered that I just don’t take transitions very well. I can remember sitting on the lawn of the student union building amidst my new textbooks and schedules and spiral-bound notebooks and feeling just plain . . . horrible. Like I was never going to “like it here.” I was a small town kid from a small high school and it seemed like everyone walking past me had the air of “I’ve got this” about them. I guess I didn’t know at the ripe age of 17 that people can cover up how they really feel. My emotions sort of hang out there for all the world to see. Funny – I grew to love my college life eventually. All those wasted tears, watering the grass at the Davies Center at UWEC. (I should really have been paid for the lush grass that surrounded that building in August/September of 1978.) So, you’d think I’d learn that when those “Ugh-ust” feelings come round year after year, to just shake ’em off, as Taylor Swift would no doubt advise me to do. But, alas, they still get to me. Obviously I don’t have college woes to consider each August anymore. (Yikes – I don’t even have any kids in college any more!) But starting each school year with the kids was a transition, for them, naturally, but for me, too. A new school year meant new teachers, new schedules to learn, new personalities to get used to, new homework rituals, new activities. Then, as the kids got older, transitioning to middle school, then high school. And don’t even get me started on how hard Augusts were when you have kids going to college. Thirteen Augusts have been wrecked for me by the thought of another school year with my kid away from me and my ability to keep him or her safe. I always seem to like the way things were. I like comfortable. I like familiar. I like safe. So here I am staring another calendar in the face and that word . . . “August” stares back at me. (Yes, I still use a paper calendar, dinosaur that I am.) The same old feelings are coming back. Again, I’m looking misty-eyed back at July like it’s my best friend moving away. I want to call August a bad name and tell it to leave me alone. Thank heavens for Maria, our daughter. She was born August 22. I wonder if God knew I was going to have issues with August and so worked it out so I’d always have a reason to celebrate that month. So, alright, August! Let’s do this! Bring on your “new” (pardon, “new!”) and I’ll try to look at you with more favor this time around. Just be gentle with me, OK? I’m new at this. In many ways, my sister and I are alike. And in many ways we are different. Since there are eight years between us, we grew up in two different “eras.” Hers was the era of the shift dress and ankle-hugging pants. Mine was elephant-bell bottoms and “smock” tops. High school girls in my sister’s day had short hair with perfect little curls on their cheeks. Girls during my high school days had long, straight, parted-down-the-middle, almost-in-the-eyes hair. We all wanted to look like Farah Fawcett. None of us even came close. Many was the time my mom made me wear my sister’s hand-me-downs. No big deal, right? Lots of little sisters get their big sister’s clothes. It was a bit mortifying, though, having to wear “peddle pushers” whilst all the other girls were wearing super cool bell bottoms. My mother was not moved by my mortification. Having both studied music and chosen music-teaching paths, we also can make a song about anything. ANYTHING. One summer we planned a surprise party for our brother’s retirement/bicycling trip to Italy. We sang every planning detail to each other and systematically drove my husband crazy. To his chagrin, we did a lot of this singing-planning in his presence and he attested to the fact that he was relieved when the party was over and the singing would cease. Until we found some other mundane activity for which we could commence vocalizing. If we aren’t singing then we can be found tapping out rhythms on whatever surface is available. Kitchen counters, tables, car steering wheels and thighs are just a few of the items we’ve converted into drum sets. So what does this all have to do with Flying Backwards? Well, we were recently together in our hometown celebrating our mom’s 95th birthday. We ended our trip with a bit of shopping in Minneapolis at the Mall of America. My sister can outshop your sister any day of the week! ……And I’m not too bad at it either. 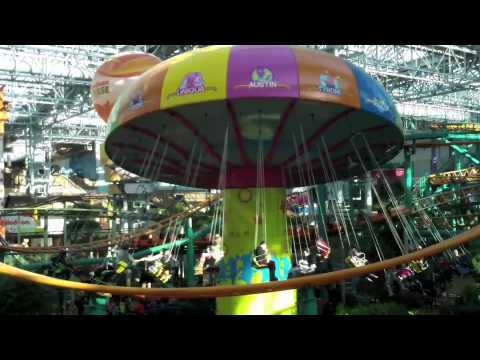 If you’ve ever been to the Mall of America (MOA) you know that there is an amusement park in the middle. Yes, a humongous mall with an amusement park in the middle. This place is HUGE! Chrissie has always been the more adventurous one. She loves to travel, I like to stay home. She wants to zip line across a jungle, I want to zip up my hoodie and sit on the couch. So you can probably guess who loves crazy amusement park rides and who doesn’t. She was trying to get me to go on one ride with her, just one. I agreed. Just one. I could see her looking with anticipation in the direction of a roller coaster that did a couple of loopdee-loops. No way. There was some other horror-machine that took you straight up vertically and then dropped you face down, also quite vertically. Not ever going to happen. We decided to walk through the park and check it out. Aha!! I remembered a ride I could probably do! We used to live in the Twin Cities and I’d had my kids there a number of times. I knew just the thing! Swings! I could handle that! Chrissie said she’d even do something as boring as the Ferris Wheel with me, but thinking that might be too slow, we both agreed to the Backyardigan’s Swing-Along. Good night. Two grown women going on something called “Backyardigan’s Swing-Along.” How embarrassing. We did notice among the throngs of children, however, there was the occasional adult rider, so we knew it could be done. We noticed one odd thing about this ride, however. Some of the swings faced backwards. Who would want to swing backwards? Not me. You can’t see where you’re going, for one thing. Part of the thrill of the ride (can a swing-along be “thrilling?”) is the feel of flying through the air, up above all the other mere walkers on the ground. We got our tickets and got on the ride right away. We were at the tail end of a line, though, so we sort of had last dibs on seats. Ideally, we’d find two together, facing forward. We’d be able to fly together and maybe even sing about it while we were up there! I nabbed a forward-facing swing, but the ones closest to it faced the opposite direction. It’s not like we had all the time in the world to find the ideal set-up; I noticed another forward-facing swing a few swings ahead. I suggested my sister go grab that one. She declined and grabbed a backwards-facing one. “I’d rather be next to you,” she said. We took our seats, strapped ourselves in and prepared for the backyardigan ride of our lives. We went up nice and high; it was pretty cool up there, flying. I know I had a big grin on my face. If I could choose a super power for myself, I’d choose the ability to fly. Since I’m not counting on that actually happening, the swing-along might be as close as I come. As we were finishing the ride, it occurred to me that my sister had forfeited not only a thrilling ride but had even given up any chance of it even being fun so she could sit next to me. Sometimes “I love you’s” can come in unexpected and ordinary ways, liking choosing to fly backwards so you can be by your sister. If anyone should have gone backwards, it was me. She was the one wanting the amusement ride in the first place. But she gave up her thrill of going upside down on a roller coaster and then even gave up the action of facing forward on the swings. It might not say, “I love you” to everyone, but it did to me. In many ways my sister and I are alike. And in many ways we are different. Chrissie, I want to be next to you, too. 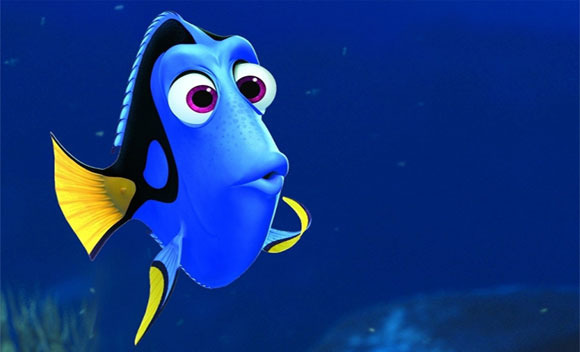 Oh, Dori. I think I’m you. If, perchance, you happen to be like me and are a bit forgetful, I’m about to make you feel a whole lot better about yourself. A. Whole. Lot. Better. . . . . .I’ve forgotten some pretty big things lately. For instance . . .
Not the keys to my car, not where I parked the car, no, that’s mere child’s play. I forgot that I even had driven a car in the first place. Allow me to explain. Just before Christmas, a friend of mine and I met for lunch at a local restaurant. We had driven separately because I had errands to run before we met. She drives a humongous truck and the idea was, we were going to go to Home Depot after lunch because we each had ordered very large Christmas presents for our husbands online and they were both ready to be picked up. Being very good wives, we ordered large, heavy items. From Home Depot. A husband’s dream. I ordered a new grill for mine and my friend ordered a power sprayer for hers. (She is actually a better wife than I as her gift was both heavier and more expensive.) After a delightful lunch, we both drove our vehicles the short distance to Home Depot. So far, so good, right? Nothing strange about this scenario. I feel it necessary here to rat on my friend just a tad: She almost went to Lowe’s instead of Home Depot! They are across the highway from each other. I SO wish this was the end of the “Oh my aren’t we forgetful, haha” story and my friend was the one who made the big blunder. Oh no . . . it gets way better than that. We parked our two vehicles and met inside the store at the customer service desk. Our large and quite generous gifts were retrieved and brought to the front. The grill was big but not too unwieldy, but the power sprayer was crazy heavy! There was no way Linda and I were going to manage hoisting that sucker into the back of her truck. No problem! There were plenty of brawny men to help us out. We were a little worried about how we were going to get it OUT of the truck, but hey, one thing at a time, right? Oops. It’s not often I have forgotten an entire automobile, but I definitely did that day. As deftly as she managed her huge truck into the traffic, she worked her way back out and back into the parking lot. And there sat my poor, forgotten little VW bug. Windshield washer fluid-tears running down the hood. But wait, that isn’t even as bad as it gets. That’s just the warm-up story. Just the other day, I hit a new low. This actually bothers me more than the car situation. It may not seem as big a deal to some of you, but to me, it’s huge! One day I completely forgot to put on my make-up. OK, now maybe some of you might not think that’s so bad. Maybe you skip make-up some days. I haven’t skipped putting on make-up a single day since the 8th grade. I don’t wear a lot of make-up, but the only places I’ll go with a bare face is any room in my house and possibly the mailbox (if I’m sure no one will walk by). I’m sure I must have applied at least a little blush before going to the hospital to have babies. I’ve even been told I don’t look any different between my “make-up” face and my “non make-up” face. It doesn’t matter. I’m still going to wear it every day. One day last week, I was sitting in the library. I had been there a few hours and it was time to head home. I went into the ladies room on my way out, did what was necessary and then went to wash my hands. I guess I looked into the mirror for the first time all day. On first glance, I thought to myself, “Wow, my make-up really faded today.” But then I squinted and leaned closer to the mirror. To my horror, I realized that my face was as bare as the day I was born!! It was as blank as a piece of paper containing Donald Trump’s “Things I Need to Improve About Myself” list. Horrified, I made for my car and my home and my bathroom and my make-up. I mentally went through that day’s activities in my mind. Who had I showed this blank canvas to? Publix!! I’d gone to Publix! I’d even seen a woman I knew there (I don’t remember from where, though, of course . . . ) and even said a brief “Hi! How are you?” Dear God. It was a wonder she didn’t turn to stone right there near the canned vegetables! I can just hear her telling stories back at . . . . church? . . . . about that poor, unfortunate Thomas woman, really let herself go. The one good part about this day, though, was when I got ready for bed that night. I didn’t have to wash my face! I know all this being more forgetful stuff is all a part of getting older, but it makes me a little nervous. What helps is hearing stories about what other people forgot. I love getting together with my Book Club friends, a group of ten women who are all near the same age and experiencing the same things. Our forgetful stories, though they seem awful when we actually do them, bring each other huge laughs when we share them. It makes us each feel less broken and faulty. When your friends are all becoming increasingly faulty too, it makes it easier to take. I hope I’ve made you feel better. This is for all my kinfolk out there who, like me, when you were a kid were either: 1.) Scrawny 2.) Non-athletic and/or 3.) Unpopular. As for me, I hit the trifecta here. Maybe you can feel my pain. Actually, there is no residual pain, but only funny memories at this point. Something today made me think of those dreaded days on the school playground and the gymnasium. What did you call that class where you had to change into a hideous uniform? We called it “Phy. Ed.” Also known as “P.E.” or “gym.” I forget what grade it was when our very small school started implementing the Phy Ed uniform. The girls wore one-piece “outfits” that consisted of a red and white striped t-shirt top that connected to red shorts. The longest zipper I’d ever seen in my life went up the back. We were mortified at our appearance, which leads me to believe we were in those awfully awkward “junior high” years. I’m getting ahead of myself, though. The main thing I want to talk about is a horrible game we played. I remember us being outside so it had to be only in the fall and maybe the spring in northern Wisconsin. It was a game that delighted many, but struck absolute dread in me. I’m talking about that one and only game . . . .
Did you play that? 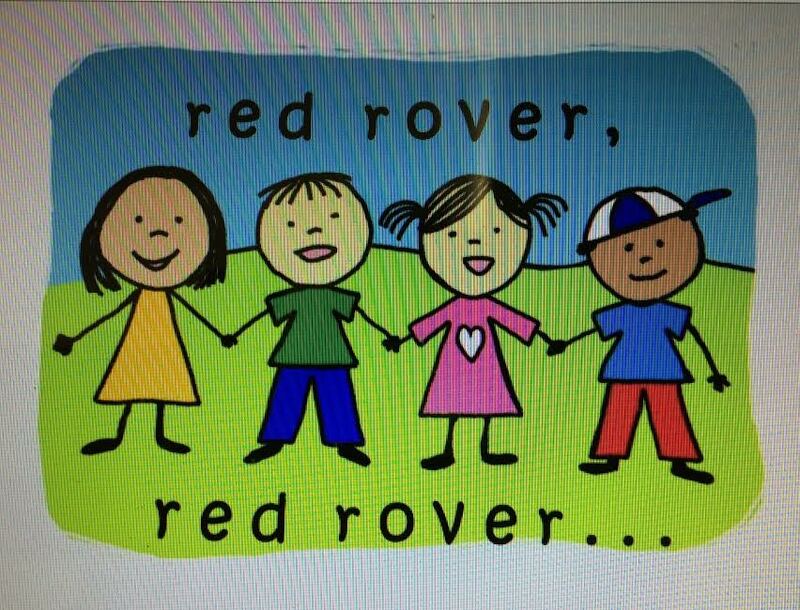 “Red Rover, Red Rover, send (insert name here) right over! !” Two lines of kids stood facing each other on the field. They all held hands as tightly as they could as a classmate would come barreling over from the other side and try to break through the clasped hands. Who decided this would be a good game for children? Attempt to either rip the shoulder out of the socket of one of your classmates, or at the very least, break some fingers or maybe an arm or wrist. Or perhaps if you’re the runner, you could bruise your ribs by running between a couple of third grade brutes with hands like Sasquatch. Heaven forbid you’re short and take a couple of linked arms to the neck as you try to break through! I think some of my earliest prayers were Red Rover-related: “Please, God, don’t let him run my way!” It was an easy-enough decision for me to simply let go of the other person’s hand I was holding, should a runner try to storm our “gate.” But, if the other kid was a bit more competitive than I (which would be every other kid on the field), and he or she was NOT as willing to let go of my hand, thus allowing the invading attacker safe passage, I was doomed to get hurt. If I did manage to disengage with whomever was holding my hand, I’d then face the scorn of said competitive classmate as he or she looked at me with disgust and snarled, “Why’d you let go? !” Oh, the shame of it all. I just didn’t want a fractured wrist or a severed artery! Is that such a bad thing? I’m not buying those happy faces. Those little stick arms are about to get pulverized. According to my extensive research (google) I found out that we have the United Kingdom to thank for this game. It has a variety of names, depending on where it’s played. In China, it’s called “Forcing the City Gates.” I guess I’d rather welcome weary travelers with open arms rather than try to hold them forcibly at bay. It’s just the nicer thing to do. It turns out that Røver is the Norwegian word for robber, so some say this game originated from a conflict in Norway. Those darn Vikings! I knew they were trouble! Alas! I survived those years and now don’t ever have to anticipate playing that game ever again. Thank You, Jesus! Of course, I haven’t even broached the subject of “Crack The Whip.” No. I can’t even go there. 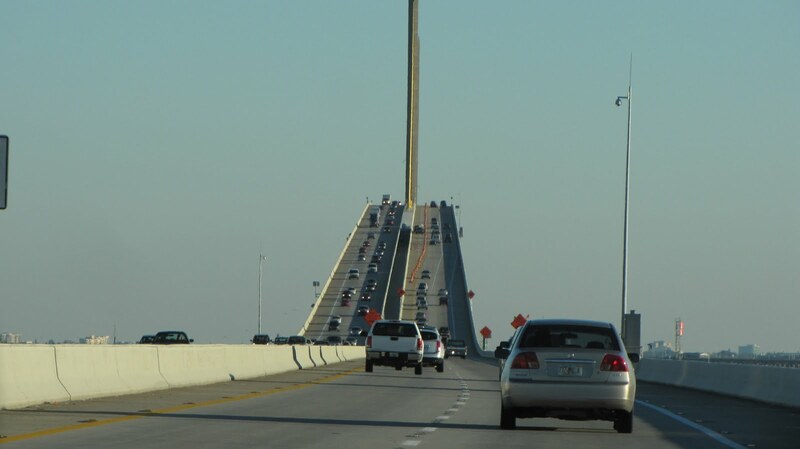 Anybody else have a phobia about driving over bridges? Little bridges aren’t bad. And even some medium-sized ones don’t scare me to death, but great big bridges? I can get dizzy just thinking about them. My sister shares this affliction with me (we like to copy each other). I’d venture to say she has it worse than I. But there was one bridge in particular that just about put me over the edge. . . . um . . . bad choice of words! 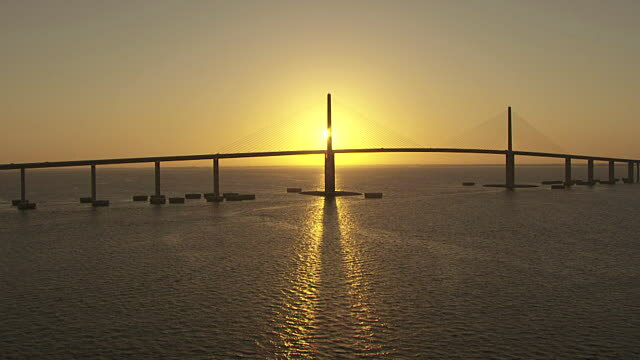 Let’s say that my unexpected encounter with the Sunshine Skyway Bridge that spans Tampa Bay rattled me at my core! But that was a couple of years ago and here I am, still breathing . . . I had been at my friend, Kit’s, over in Clearwater Beach for a mid-winter college-roomie weekend. It’s a jaunty 4ish hour drive from where I live on the west coast of Florida to her place on the gulf. I drove west at the start of the weekend going through farmland and citrus orchards. I greeted many a cow and orange on the way there. I met my gal pals at a mall in Tampa as two of our other friends were arriving from the Midwest into the Tampa airport – and from there we headed over to Kit’s (over a few bridges, mind you, not scary ones, though). We proceeded to have a delightful weekend, as we always do, and then, alas, it was time for me to head for home. Relying on my trusty GPS, I plugged in “home.” I imagined I’d be going home the way I came – through farms and orange groves. My GPS was taking me a different route. Since I didn’t have the mall in Tampa in my scope this time, it was taking me south before heading east. I really like familiarity, and cows, but I know there are also more ways than one to get somewhere, so I just trusted I’d get home along this other route. When I first saw the bridge, it was still a long way off. I couldn’t even quite tell if the bridge was on my route, so I didn’t panic immediately. Oh no, that came a little while later. But panic, I did, to be sure. Even from far away, I could tell this thing was enormous. I didn’t know what else to do. I suppose I could have turned onto some other road and I’d hear “Recalculating,” and I’d be directed another way. But I still wasn’t certain that bridge was in my path. So on I went. It became apparent I was to drive over that bridge. 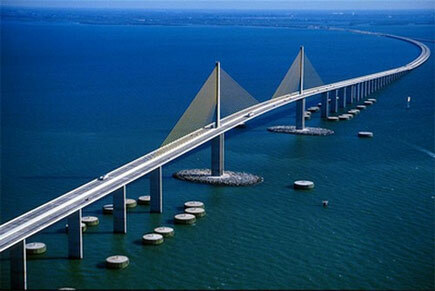 For some reason, cable-stayed bridges seem the scariest to me. Suspension bridges, though also intimidating, seem sturdier for some reason. Of course this particular bridge was the former and not the latter. I started to go up. The pitch of this thing is incredible! It is so steep! I don’t like driving over steep hills, let alone a steep hill in the sky with nothing but water underneath! Look how steep this is?? Not knowing what is on the other side scares the daylights out of me. As I was climbing this mountain-in-the-sky, my heart was racing and I could feel myself getting light-headed. Great. How about I just pass out while driving an automobile on a busy bridge in the middle of the sky? I knew that wasn’t a good option. So I started saying the first Bible verse that came into my head. “Trust in the Lord with all your heart and lean not on your own understanding; in all your ways acknowledge Him, and He will make your path straight.” (Proverbs 3:5-6) First I said it quietly, but I got louder as my pulse (and the pitch of the bridge) increased until I was yelling. I’d repeat the whole thing and then just bits and pieces. I can only imagine what I looked like to passersby: A crazed woman white-knuckling the steering wheel of her VW bug, eyes bulging, chest heaving and screaming Proverbs into the dashboard. Not exactly a Chamber of Commerce photo opp. I still don’t love to cross bridges. In fact, I will avoid them if at all possible. But I also know bridges are marvelous creations that link places together. They really are things of beauty. I guess it’s all in one’s perspective. I’m trying to remember that even if I can’t SEE what’s on the other side . . . the other side of the bridge, the other side of a new project, the other side of a problem . . . . I know God is there already. He told me so. 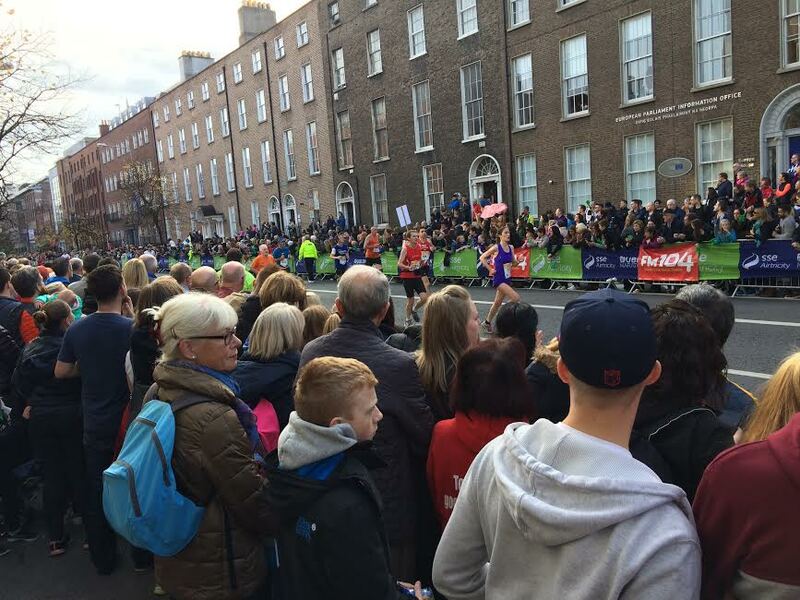 This is a story of how I started out going for a walk and ended up having an epiphany near the finish line of the Dublin marathon. My feet were killing me! Being a Floridian, I don’t normally wear enclosed shoes and socks on a daily basis. Or ever. In my sandals, my bunions are unrestrained. I almost didn’t go to Merrion Square that Sunday, but didn’t want to spend the day just sitting in our hotel room either. Kevin was golfing that day at a local course with some colleagues. So I bandaged my bloody bunions and shoved them into my shoes. The park was just a couple of blocks around the corner from where we were staying. As I got closer, I could see something was awry. The street ahead was blocked off and I could see portable fences set up around the park. I surreptitiously checked my map (heaven forbid I look like a tourist) and yes, that blocked off park was indeed where I wanted to stroll. It didn’t look like I’d be doing that today, however. There were lots of people walking that direction, though, and instead of heading back to the hotel in defeat, I followed the crowd onward. A small group of people had gathered at one spot and were talking to a man wearing an official-looking vest. He was pointing down the road even farther and then I figured out what was happening! I had come upon the finish line of the Dublin Marathon! A ways beyond the vest-wearing pointer I could see a large green banner that marked the finish line. Like a lemming following the crowd, I followed the people that were headed down the street and around the corner. I had to walk a ways before I found an avenue up to the actual street where the runners would come by. I could hear cheering and clapping (actually many people had those little plastic clappy hands that you shake and it claps for you, something I would come to wish I had as well). As I approached the clapping crowd, I managed to find a small niche where I could stand and see pretty well. The first runners had already come by. 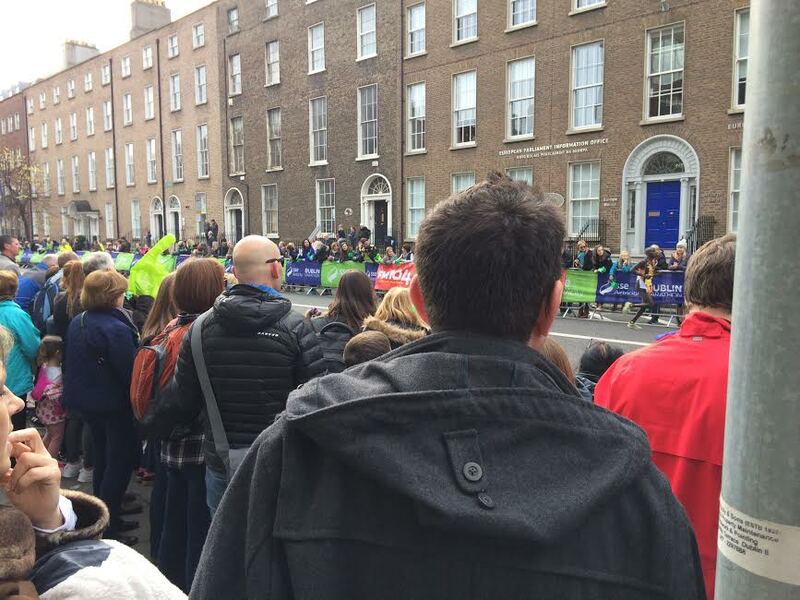 The crowd mellowed in those moments of no one coming, but then as the people closest to the street could see the runners coming, the cheering started again. The clappers clapped again. I found it impossible NOT to clap my hands as I saw my first marathoner run past, so close now to the finish line. Soon more and more runners came by. The first runner I saw and clapped for that day. You see, I’m probably never going to run a marathon. Have no desire to do so. But to be one of those who cheered on the runners, THAT thrilled me. That felt like my job. This all makes me think of when Joshua is fighting the Amalekites (Exodus 17) and Moses is praying for him. When Moses had his hands lifted in prayer, Joshua would be winning. When Moses grew tired and lowered his hands, the Amalekites surged ahead. So two other guys, Aaron and Hur, actually help out by physically holding up Moses’ hands so he could continue praying and Joshua would win the battle. And so he did. And so THEY did. Joshua was on the frontlines, but he had several encouragers petitioning God on his behalf. We aren’t all meant to be the one everyone is looking at. But those out front need those of us along the sides to cheer them on. I don’t know if I’m a Moses or an Aaron or Hur, but I’m typically not the “Joshua.” I wasn’t that day at the marathon. I wasn’t the one running to the finish line with thousands of onlookers cheering for me. Nor do I care to be. But to be one of the encouragers? One of the helpers? I think that’s my place. And I find that thrilling. And soon, many runners were upon us. These folks on the sidelines are my peeps. 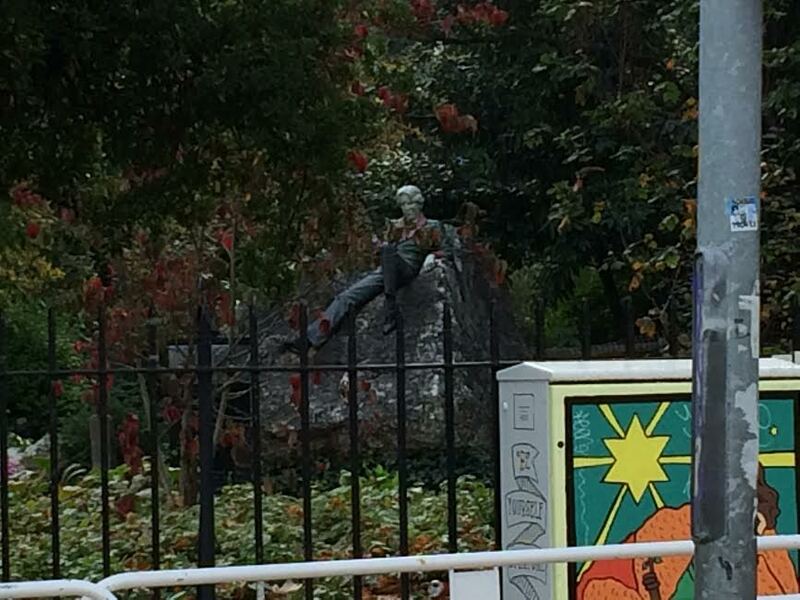 Here’s what I came to see: Oscar Wilde reclining on a rock. How could he sit at an event like this? I’m currently sitting in a Delta lounge at JFK airport with Kevin. We don’t board our flight for another 3 1/2 hours. In the meantime I’ll eat free food and drink free wine. Not a bad gig, if you can get it. As a certified “homebody” I will tell you that some days I only make it as far as my mailbox. And that’s just fine with me. This business of going over the ocean has me a bit rattled. * What if my body just can’t handle the time difference and I fall asleep for the night at 2:00 tomorrow afternoon, no matter where I am? * What if I don’t fit into the group with which I’ll be traveling? (This is a business trip for Kevin.) Will I do something untoward and humiliate my husband in front of his peers? * Are my bunions going to be an issue? I’m not used to wearing “shoes.” Are people with bunions even allowed into Ireland? I know, such dumb things to fret over. I should, instead, be so grateful for this wonderful experience. It’s just that right now I’m a little concerned about my sleep (or lack thereof), my fitting-in-ness and my bunions. I’m going to sincerely try to practice being more grateful. And less neurotic. Right now I’m about 50/50. Let’s see if with God’s help, and perhaps the help of some Irish folk, I can’t improve that quite a bit over the next several days. Beautifully crafted word pictures are some of my favorite things. Another of my favorite things are music notes on a page. I guess that’s my second language. If you smash the two together, you may come up with . . .
Hymns. I know, how terribly old-fashioned of me. Don’t get me wrong, I do love praise & worship music, too. And I get the whole idea that it is the genre that seems to draw more people into church. And I get that it also, with its easy words and its few words, makes for easily singing these songs with eyes closed. Somehow that seems to have translated into “better worshiping” than singing from a hymnal. I’ve listened the last couple of mornings to some old hymns and their beautiful words have caused me to close my eyes. Here’s today’s “hit” – Be Thou My Vision, written in 6th century Ireland! Thank you, Eleanor Hull, for translating it to English in 1912. That’s all I have to say about that . . . . 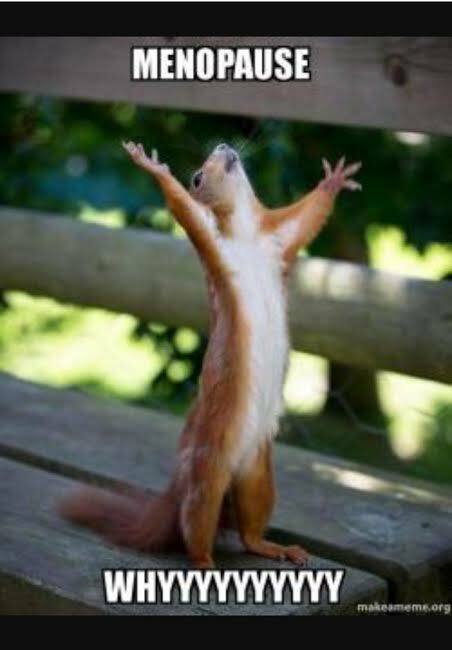 I love when squirrels help us interpret our emotions. Shortly after midnight in the wee hours of August 22, 1987, our trusty springer spaniel, Gunther, needed the rest room facilities, and so I got my very largely pregnant self out of bed and tended to my pup. As I returned to bed, I felt the first of the contractions that would eventually lead Kevin and me to welcoming our first baby into the world, our Maria. Because I write everything down and basically am a bit OCD, I kept track of these contractions on a notepad that I had next to my bed. This went on for several hours, me sort of dozing in between contractions. Kevin snoozed peacefully beside me, Gunther at our feet. Just one big happy bunch of deep breathers. After several hours of this “labor,” I had an incredible thought . . . The point is this: Denial is more than a river in Egypt, it’s a place I reside on a regular basis. I took up residence there while charting my contractions and thinking I’d get by without it hurting, and now I find myself there again at another stage in my life as a female . . . . menopause. But then the hot flashes started. I heard talk of becoming more forgetful when menopause comes to call. OK, there is NO living in Denial Village on this one. This one I definitely experience, to the point I sometimes worry I’m losing my mind. A little foggy between the ears? Dear God, I hope that doesn’t continue to decline or I’m in big trouble. The crepey skin is a little alarming. When you live in South Florida, it’s hard to wear clothing that covers all the flaws without causing heat stroke, so that crepiness is generally out there for the world to see. Not a lot a gal can do about that. But let me give you fair warning on something you should never do: Never, and I mean NEVER assume “downward facing dog” yoga position when you’re just wearing shorts. Your eyes will go straight to your thighs and that is enough to send you into a downward spiral of “oh-my-gosh-what-happened-to-my-legs?” I’ve made this mistake and by eyes still burn. There’s no erasing that from your memory banks. Insomnia is not something I’ve had to deal with . . . yet. I have a night here and there when I can’t fall back to sleep if I wake up. Hey . . . do you think maybe I’m miracle-woman in this one small area??? “‘Denial Village’ . . . where you’ll live happily, albeit delusional, ever after . . . ” *sigh* I suppose not. If there’s something that gives me comfort in all of this menopause business, it’s knowing that we women all go through this. Some of us have had babies, some of us haven’t. Some have gotten married, some haven’t. But we all have this place in common where we end up together: MenopauseLand. We may arrive at different times and some have harder times than others getting here, but when we share our stories, we don’t feel like we’re the only ones feeling this way, and it sure makes the journey easier. And actually pretty funny. 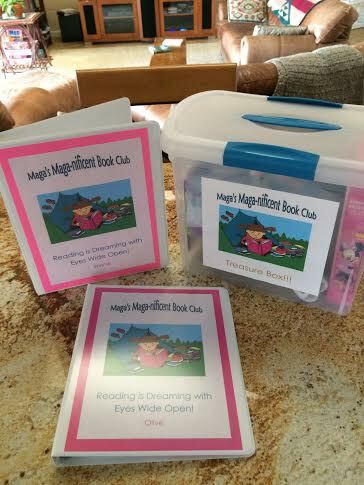 Maga’s Magnificent Book Club: One way to be a long-distance grandma that makes a difference. Sometimes I feel like I was born into the wrong era. I long for “the family farm” where I live with my husband and probably more than one dog. My kids all live just ‘down the road apiece’ with their families and they all gather in my kitchen every morning for coffee and a hot breakfast. (I suppose that means I’d be cooking that breakfast, in which case I’d be handing out bowls for cereal.) We’d all work together and tell stories all day and laugh. The farm hands (not one of my kids impresses me as farm hand, but in this daydream, they all embrace their roles lovingly) saunter up to the main house at quittin’ time and come into the kitchen saying something like, “I’m so hungry I could eat the whole of Texas right now.” (Someone said that in a southern accent, yet this fantasy farm is in Wisconsin. It’s a little mixed up.) We’d slap each others’ backs and sit down to some fabulous meal I’d have whipped up (or more likely picked up) and naturally, my grandchildren would be at my side, begging me to tell them about the good old days when I was a kid. Problem is, in real life, none of my kids live down the road apiece and my three darling granddaughters live 3 states away. When I go visit my daughter and her family, I love to drive through her neighborhood and pick out “my house.” In THIS daydream, I live on the same street as Maria and her family and the kids come over on a regular basis. I’m just a stone’s throw away so can help out whenever someone get’s sick or Maria needs to run somewhere and doesn’t want to haul all three girls. Naturally, I’ve got their favorite snacks on hand and so coming to my house is as comfortable as being at their own home. SKIIIIIIIIIIDDDDD. OK, enough of this dreaming. I consider myself pretty lucky to see them as much as I do, which is about every 6 to 8 weeks. 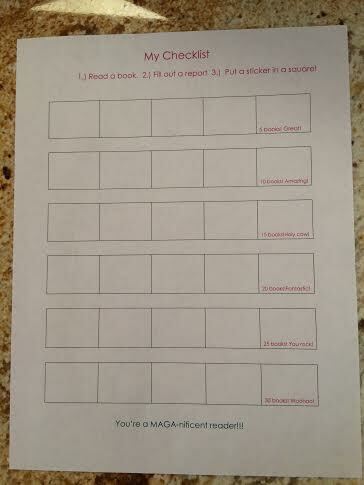 I dreamed up a little something (dreaming seems to come natural to me) that would help me be a more intentional grandma. It comes from something I’ve loved ever since I was little . . . . . books. 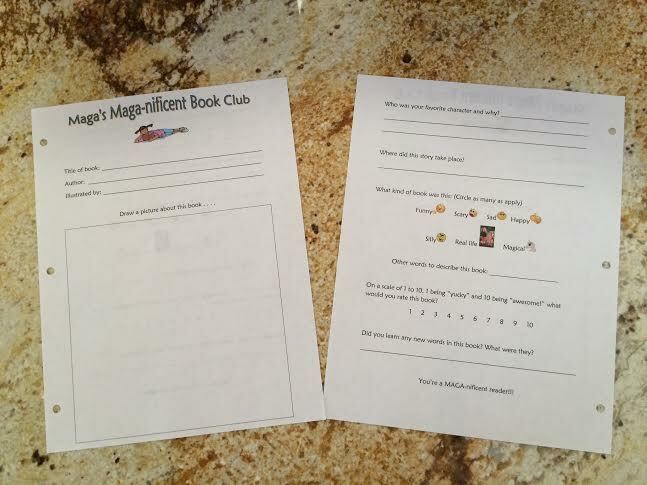 And so, “Maga’s Magnificent Book Club” was born. I think if you love books, and are a good reader, learning anything else is just that much easier. 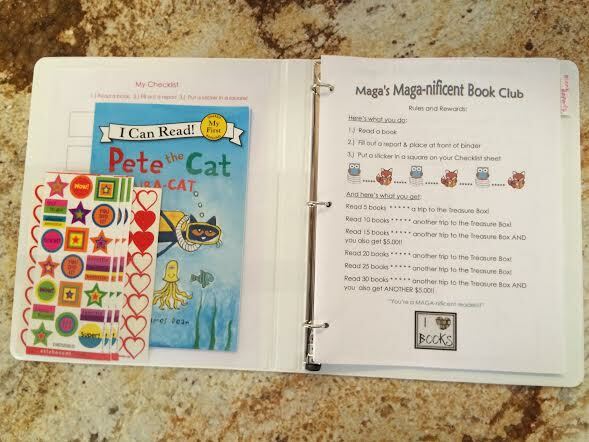 I want my girls to love reading as I have. So, here’s what I did! And there you have it. Complete with blurry pictures. I’m hoping that this might be a way for them to feel like I’m not three states away, but right there with them. If anyone has any other grandparenting-from-afar ideas, I’m all ears!